There will be a competitor’s class THIS Wednesday, Feb 19 at 7:30 PM. Please register in MindBody. We are so proud of our 6 awesome athletes who competed at Garage Games One over the Weekend! Cass competed first on Friday. 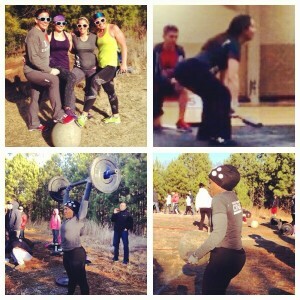 Andrea, Lauren, Brooke and Chrissy, Beast Mode Bunnies, competed as a 4 Girl Team on Sunday. It was the first time competing for Chrissy, Brooke, Cass and Octavia! Way to go, ladies! Great job conquering fears, stones, sandbags, axles and the clock! If you are curious about any upcoming competitions these ladies are wonderful people to ask! There are competitions for all levels. It’s a great time to really test your limits. Click the athletes names above to learn a little more about them. Andrea‘s is linked to an excellent blog post on competing that she wrote for us back in September. Team Paleo Challenge Last 5 Days!